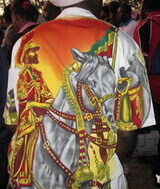 The symbols of the Rastafarian movement are evident all over Jamaica. The vivid red (ites), green and gold and the image of the Lion of Judah can be found in every corner of our country. 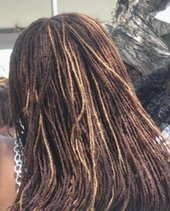 Dreadlocks, which once carried a negative stigma, have become an accepted and trendy hairstlye outside the Rasta community. Rastafari has influenced Jamaican language, and has had a profound impact on reggae music. At the centre of Rastafari livity (lifestyle) is a celebration of African heritage, behaviour based on teachings of the Bible, and belief in a natural relationship between man and the environment. Most Rastas have a distinct manner of dress (rasta colours, dreadlocks, flowing clothes, African prints) and speech. They emphasise the use of natural (ital) foods, and many are vegetarians. Most do not drink alcohol, and pork is considered unclean. Ganja (marijuana) is viewed as a sacred herb. Smoking it is seen as a means of gaining wisdom and communicating with God (Jah). This often leads to clashes with the police, as the cultivation and use of ganja are illegal in Jamaica. Rastas sometimes gather to drum, sing, dance and to 'reason' (discuss the Bible and life in general). When this is done on a large scale, it is called a Groundation or Nyabinghi. Not all Rastas like having their picture taken, so it's polite to ask permission before doing so. "Ras" or "Dread" is how most Jamaicans will greet a Rastaman whose name they don't know. "Empress" or "Sistren" may be used for the ladies. Given that Rastafari began as a movement of outcasts who were belittled and persecuted in their own country, its scope and impact today is remarkable. The teachings of Marcus Garvey and Alexander Bedward in the 1920's provided a setting for the birth of Rastafarianism. Poor, black classes identified with their ideas of black dignity, unity and action. A high point for those embracing these teachings came in 1930 when Haile Selassie (formerly known as Ras Tafari, or Crown Prince) was crowned Emperor of Ethiopia. In the early 1930's Leonard Howell, Joseph Hinds and Thomas Hibbert began the movement in the hills of St. Thomas. They later moved into the slums of West Kingston, attracting poor youths who were dissatisfied with the neglect and hopelessness under the British colonial system (Babylon). Rastafarianism interpreted the Bible in terms of the needs of black people. Selassie was viewed as the black reincarnated Christ, due to his being of King David's lineage. Ethiopia was the promised land, and repatriation to Africa became a central goal of the early movement. The Rastas adopted the colours of the Ethiopian flag as their main symbol, along with images of Selassie, often depicted as the Lion of Judah. In the early days, Rastas had many confrontations with the police. Rastas were considered to be causing civil unrest. Leonard Howell was jailed twice. A Rastafari leader, Claudius Henry, along with some American Black Power activists, set up a camp in the hills of St. Andrew in 1959. In 1960 the camp was raided by the security forces. They allegedly found firearms and the newly made grave of an executed member of the camp. Henry was arrested with several others for treason. Some were hanged, including Henry's son. The country's distrust of the Rastaman grew. In 1966 Haile Selassie visited Jamaica. It was a great moment for most Rastas, but a disturbing one for some when Selassie was seen to have fine features and light brown skin. Even worse, he disclaimed leadership of the movement, as well as his status as Messiah. The philosophy began to shift slightly, and gradually the "Back-to-Africa" way of thinking was replaced by a view that despite oppression, Jamaica was blessed - JahMekYa (God made here). Towards the end of the 1960's and into the 1970's, Rastafarianism began to attract intellectuals and people from the middle class. Many of these felt pulled by the Rastas' simple, easy going, natural lifestyle.